Six people at my church wanted to learn how to make banners. One person had experience making baby quilts. Another person loved fabric stores but knew little about the qualities of different fabrics. The others were curious but had no experience with sewing or other aspects about banners. We decided to make six small banners for Advent. They would fit pleasingly along the long walls on each side of our sanctuary. Each person agreed to make one of the banner fields, with the sewing person teaching the others how to use her sewing machine. I would design the elements, sew them, and the six would help attach them to the fields. To save labor, we chose to make one side of the banners for Advent, and the other side for Epiphany. Each banner would be 40 inches square. For variety in hanging, the Advent banners hung on the diamond, with thin willow branches threaded through and extending beyond the four borders. The Epiphany banners would hang on the square. We added artificial foliage and calligraphy on rice paper to make them highly different from the very simple Advent banners. Advent means the approach of Christ’s Light into the world. So we wanted fabrics of dark to light colors and different prints. The prints had to be large enough to be seen from a distance, but not so large as to compete with the element on the banner. We chose to make the elements solely out of silver and gold metallic lamé. The students left the choice of elements and their design up to me. 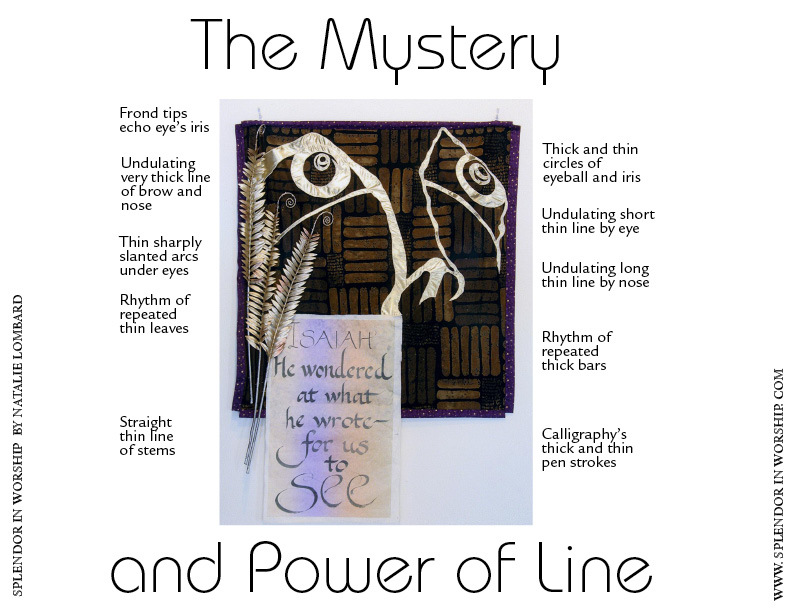 At that time in my own development as an artist, I was fascinated with line, its movements between thin and thick. Because of limited time, I needed to make the designs as simple as possible. I was increasingly aware of my own feelings when God revealed things to me, whether reading His Word, viewing a picture, or listening to a spoken word. I remembered times I despaired, times I was puzzled, and times of insight and healing. Each caused a different facial expression, a different look in my eyes. Epiphany means “a sudden knowing” or “an awareness of pure insight.” I decided the elements would be faces, minimally drawn in simple lines, with emphasis on the eyes. Having agreed on those concepts, we visited the local quilt fabric store. What a feast for the eyes: colors galore, innumerable prints, all sturdy cotton fabric, easy fabric for beginners to handle. I showed them how to hold up a yard of fabric while the others would view the print from across the shop. If the print could still be seen at that distance, it qualified for our project. We had to remind ourselves we were not making quilts, which use a number of different prints: we limited ourselves to one print per banner, the colors moving from dark to light. One totally different fabric for the borders would unite the entire series. After many considerations and letting go of various favorites, the students chose a dark brown with a large paver-like print, a medium purple with small flowers, and a medium blue with three-inch-diameter flowers. The border fabric was a very dark purple with tiny gold specks. The banners were installed in pairs, across from each other on opposite walls, the dark ones being nearest the door into the sanctuary, the brightest ones nearest the chancel altar and cross. 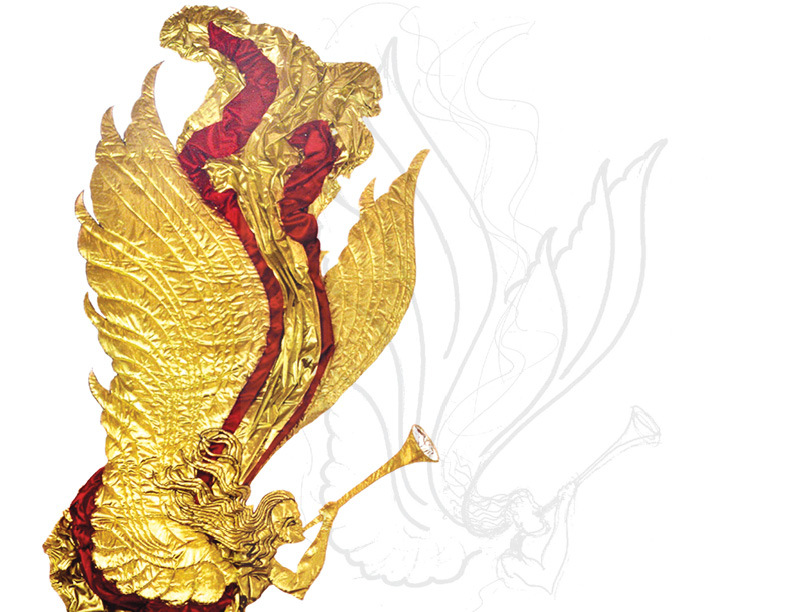 I was commissioned to design a pair of angel banners for a Christmas concert at First Baptist Church of Geneva, IL. The design challenges: fill the dark walls on each side of the arch with glorious Christmas color, and point focus to the central cross. 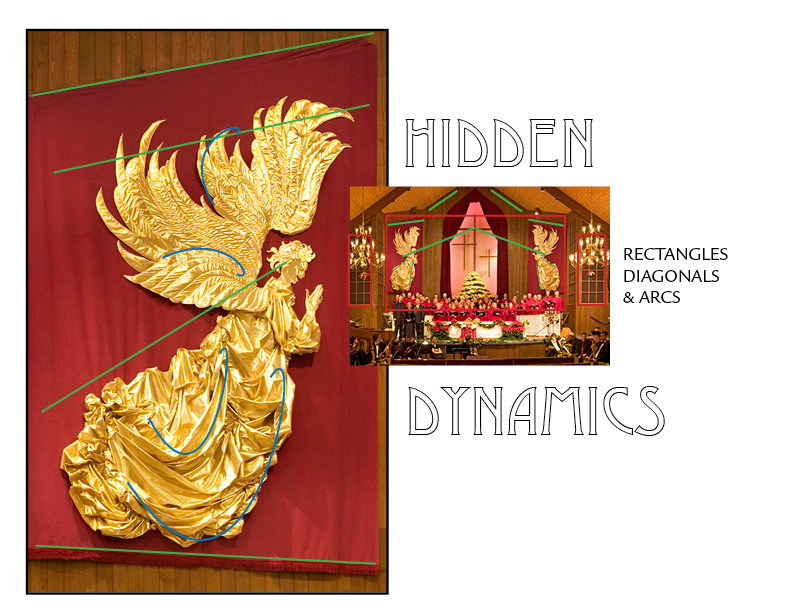 The solution I chose: use many diagonals – the diagonal edge of the banner matches the ceiling slope, the angel wings have numerous curves arcing toward the center, the angels lean toward the cross, the top of the wings tilt toward the crossbar, the angel robes cascade in counterpoint to the wings’ thrust. These banners are 9' wide by 15' tall. When starting an art commission, look – and I mean really look – at the lines and angles in the sanctuary. Most buildings use post and lintel architecture, resulting in rectangular walls, floors, ceilings. Sometimes there are triangular and circular shapes. Compared to the vertical or horizontal line, the diagonal line and the arc are the most visually interesting. Sit in the sanctuary in silence, looking at wall spaces where banners might be installed, at angles, and curves, and where the sunlight and electrical lights illuminate. Photograph every aspect of the sanctuary Chapter 5. Feel the space. Gaze at and study the photos at home. I ask the Lord, “What do You want to say to this congregational at this time in their history of walking with You?” I do not proceed until I hear from Him. Once He gives me the visual concept, I work with the energy I sense from concept (this is spiritual sensing) to find the lines of keenest essence (this is compositional work). These essential lines in the design work together with the rectangles, diagonals, and arcs in the sanctuary architecture. As a result of this creative process, an artwork is not a separate item installed in a space, but an integral dynamic visual, emerging from and integrated into the space. Worshippers sense this merging and emerging of dynamics, though they might not be able to articulate it. At some level, whether distractedly or purposefully, worshippers are aware the sanctuary is a place where God is present, so they are already sensitive in their spirits. 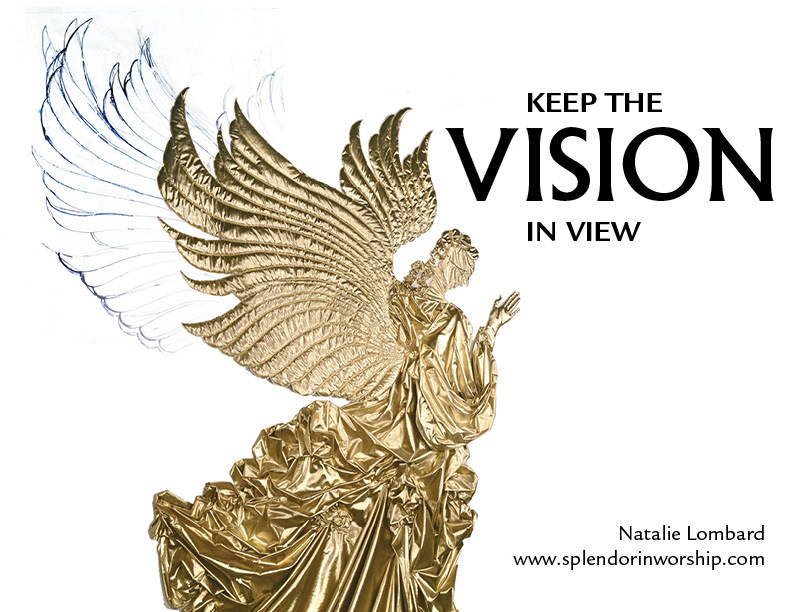 The dynamics of visual concept, merging and emerging lines working together, and the worshippers’ spiritual awareness usually come together in a visceral experience of the splendor of God. Impact stories of my angel banners Chapter 3 are in my book, Splendor In Worship, available on Amazon and at www.splendorinworship.com. My beginning angels were sewn to background fabric, usually bleached muslin because of limited budget. But as I developed my technique, I wanted the angels to seem suspended. How to do that, I had no idea. With each art commission for angels, I tried different ways of making the wings look more alive: more padding, smaller stitches in the long curves, tacking just the wing tips to the background, literally lifting the wings off the background and tacking just frequently enough to hold the lift. A church with a two-story-tall white chancel wall commissioned a pair of angels to flank their cross at Christmas. This time I attached battens to the back side of each angel to support the wings and top rippling fabrics. A person on a tall ladder hoists each angel from the ground on a single pulley and ties off the ropes on a cleat, entirely hidden by the angels. The angel banners, my signature piece, developed over time. For the first pair, the Lord gave me the design. After a long night of working out concepts for Christmas banners, I rested my eyes, my fingers holding my pencil loosely. I asked the Lord what He wanted. Suddenly my hand shot forward, and by the time I opened my eyes, the Lord had drawn a few squiggles – but oh what squiggles! They showed the full energy of the angels, hovering in adoration of Him! I had no art commissions for these angels. He said I was to make them for Easter. I had no idea how to make these angels. So I studied real birds lifting off a nearby lake and sweeping in for landings. Expert photographs of birds in flight showed me the sweeping lines of whole wings as well as feather patterns. Drawing on 10 foot lengths of craft paper, I wore out many pencils exploring the curve of wings until I found just the right lines to capture the angel’s glorious sweep, both powerful and gentle. I kept the squiggled lines close by as I experimented, explored, pushed details, tried lines again and again. Drawing is two dimensional – flat. How was I to make the wings seem 3-dimensional and alive? Fine detailed work feels like a swarm of mosquitoes to me – I prefer large dramatic expression. Working with three layers of material – top layer of gold metallic lamé, cotton batting in the middle, and white muslin for backing – I experimented with long stitching lines. They in turn created the little puckerings that added their own sculpting and vibrancy to the whole. I had no idea how to make the angel’s dress. When visiting art treasures in Europe as a child, I was fascinated with cascades of fabric. The Lord implanted in my soul the surge and flow, the light and shadow which the great masters Van Dyke captured with oil paint and Michelangelo expressed in marble. 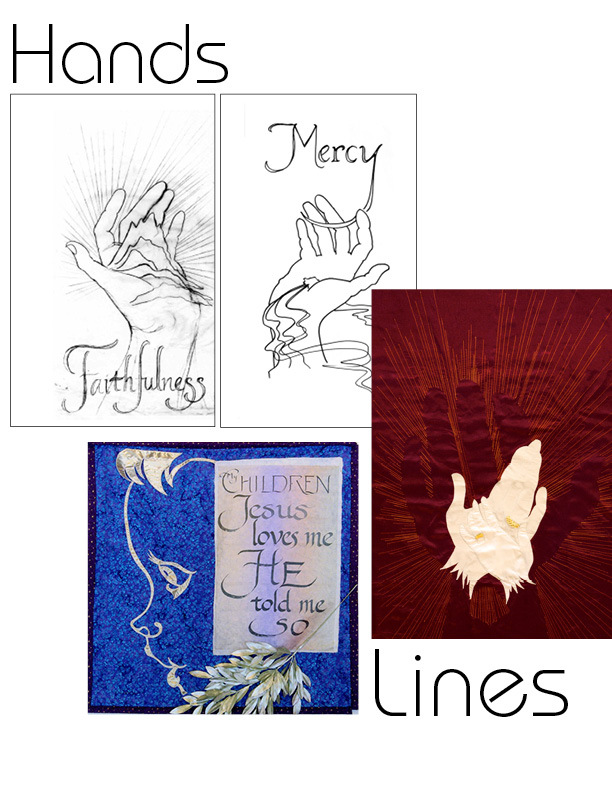 Then twenty-five years later, when trying to work with fabric to express the beauty and energy of the Lord’s lines, I stood frozen, unable to figure out how to make the fabric do what I had seen in the squiggles. I asked the Lord to work through my hands again. He said, “You already know what to do. I taught you in Europe years ago. Now it’s your turn.” To my amazement, as I gathered up handfuls of fabric from off the bolt, my fingers did know – making sweeping cascades, abstract rosettes, surrounded by glintings from scrunched fabric, each casting different qualities of light. that includes 200 color photographs, sketches, and designs for your use. The barren office ceiling was transformed with dramatic sweeps of fabric, with the translucence of gauze and cut-away, with the play of light along the folds, and the twinkling of the tiny lights. Long sweeps of gauze interspersed with decorative panels add interest, variety, as well as ethereal and dramatic beauty to cover up the rawness and the unremitting rectangularity of an industrial ceiling. The gray metal structures were adorned with exhilarating expanses of illuminated fabrics, evoking images from God’s Word in the worshipper’s experience. The otherwise bland office space was transformed into a place of beauty and worship with merely fabric and light.